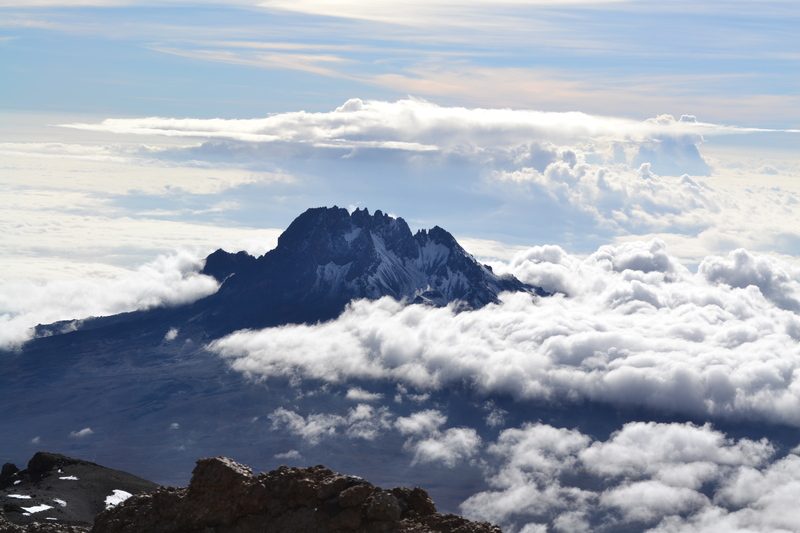 After being in Africa for over 10 years, having travelled extensively around the continent and passing Kilimanjaro many times – even having worked nearby with daily views of it – I decided that it was time I tackled Africa’s highest mountain. When I told my Mum of the planned venture she decided to join me and we turned it into a 2 week adventure by going to relax on Zanzibar after the climb. I researched the routes and best time and decided to do the 7 day Rongai route in October. This route is quieter and the extra day on top of the 6-day trek would give me more time to acclimatise. I like hiking and had done long day hikes, some at altitude before, but had never attempted a mountain. To prepare for it I went on regular walks in the afternoon, a route with some uphill roads to get used to the going up. Then after several months, the date had arrived. 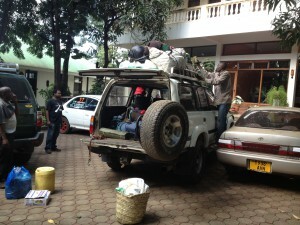 I picked up my mum from Kilimanjaro airport and we spent the night in Moshi, which is the base for the Kilimanjaro hikes. In the afternoon we had a briefing with Samson, the head guide for the Absolute Africa climbs, who makes the mountain arrangements. He made sure we were all well prepared in regards to clothing and our gear and explained how it would all work – after t hat we were good to go! We packed our gear and luggage to take up the mountain and the bags we were leaving behind. The hotel has a luggage room and a safe for valuables. 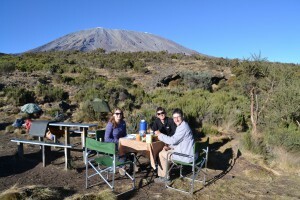 Day 1 – Our group of 4 – myself, my mum and two others, Kate and Paul, were picked up at the hotel around 9 am to drive to the Marangu Gate which is the main gate to Kilimanjaro National Park. Here we registered and the entry fees were paid. 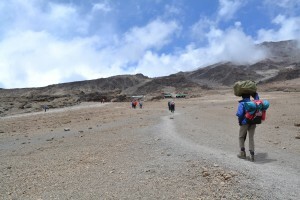 From there we made our way to the Rongai Gate collecting gear, the guides and some porters along the way. At the gate we had lunch and got introduced to our guides, William and Suleman. After lunch our little group set off under the guidance of William, while Suleman stayed with the porters to sign in the group and sort out the luggage. That afternoon was a pleasant walk through forest and some farmland. A group of school children who go to school in Kenya also walked with us, which was fun. They walk across the border each day to go to school, the Rongai gate being very close to the Kenyan border. There was a bit of a drizzle but nothing too bad to dampen our spirits. Some entrepreneurial villagers had set up a drinks stand close to a picnic stop trying to sell us sodas! 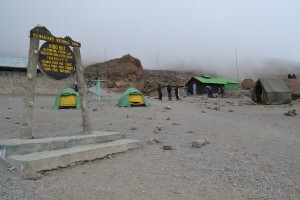 After about 2 hours we arrived at our first camp, Simba Camp, at 2,600 metres. We had a short break and then did our acclimatisation walk. 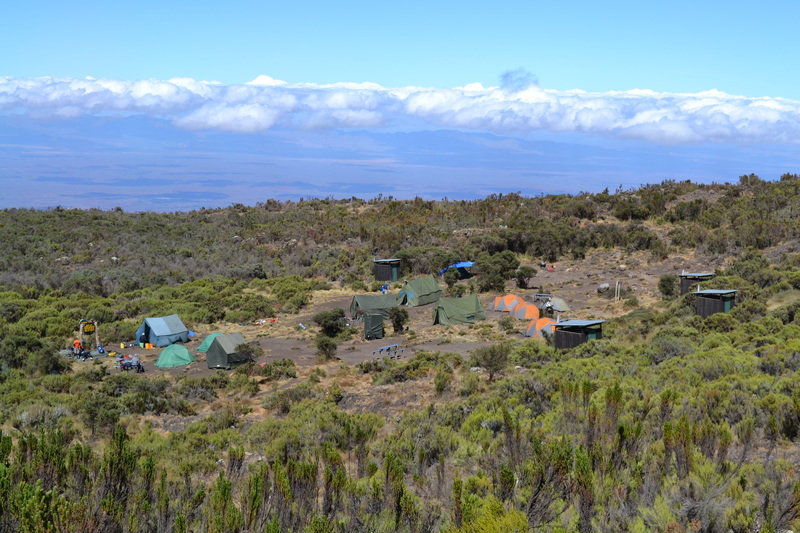 A short walk to climb 100 metres and then come back down to the camp to help the body acclimatise. By the time we returned everyone had arrived and set up camp and we were welcomed by the whole team in song. After that we got settled and had afternoon tea in the mess tent. The camp was shared with a few other groups this night. And early to bed, ready for the next day. 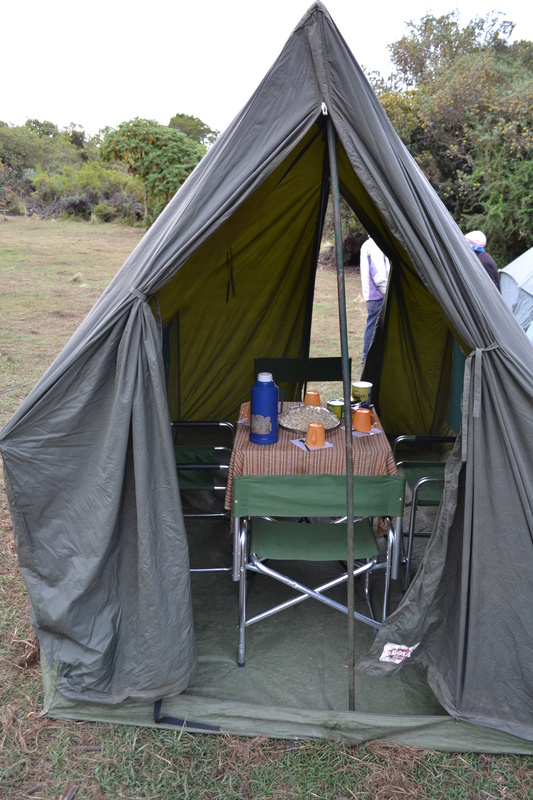 Day 2 – The morning started with a wake up call and coffee or tea brought to the tent. After that we were brought warm water for washing. Getting up out of the tent we were greeted by the magnificent sight of Kibo, Kilimanjaro’s highest peak, covered in snow as it had snowed overnight. After a great breakfast we set off along the path. Most of the way we were walking towards Kibo. Turning around we had amazing views over the Kenyan plains below us. The walk took the whole morning with some stops along the way to enjoy the views and get a rest. Slowly during the walk the vegetation grew less and smaller. We also did more climbing today so the pace got slower to save our energy. By midday we arrived at Second Cave, our next camp, at 3,450 metres. We had a cooked lunch and then got some time to rest before doing another short acclimatisation walk later in the afternoon. We climbed up to a viewpoint with fantastic sweeping views over Kenya and on the other side is Mawenzi, Kilimanjaro’s second highest peak. Upon our return the team sang again and everyone was introduced to us. There were about 17 staff in the team , with a chef, waiter and porters who all had other odd jobs as well. Again afternoon tea and later dinner. The stars were amazing so high up out in the open. 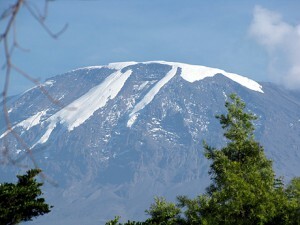 Day 3 – This morning we had breakfast outside and more gorgeous views of Kibo. We set off again on our wa lk. As soon as we would leave the camp with one of the guides – today that was William – the other guide would arrange the porters to take down camp. They would then at some point pass us along the way and camp would be all up and ready by the time we would arrive. Over the days we got a lot of respect for the team as we were only carrying a day pack but they were carrying big bags all the way up. Then would collect water at each camp from the nearby well as well. This day we broke off from the main route. The path got smaller and we saw no one else but our group. Walking along the views of the Kenyan plains got more and more impressive as the clouds cleared. The weather was absolutely beautiful. 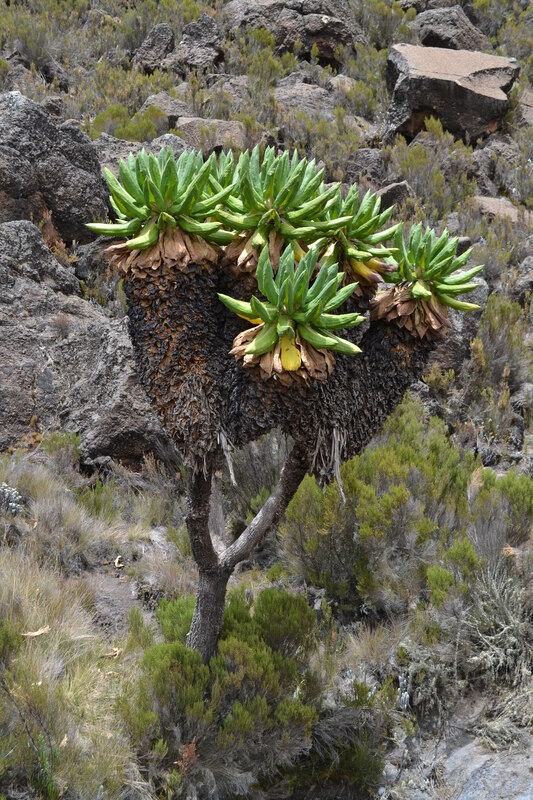 The vegetation turned more mountainous with smaller plants, more used to a dry climate. This side of the mountain that faces Kenya does not get much rain. 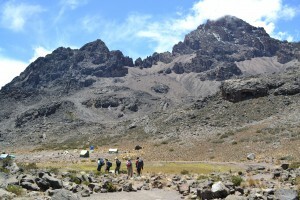 Again we arrived at our camp, Kikelewa Caves at 3,600 metres, around midday. This camp had several big tree like plants growing in the area, called senecios. 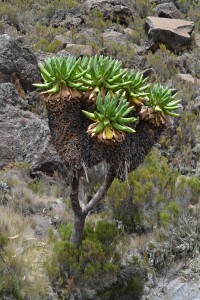 They are altitude plants and grow only at this altitude on the mountain. A common bird that we saw around the camps was the white necked raven. There were also lots of pretty striped mice were around. The routine this afternoon was the same, an acclimatisation walk, afternoon tea and another great evening meal. Each evening one of the guides would come and do a briefing about the next day to explain what was happening. The meals were great, a mix of local food and lots of carbs to give us energy. Every day the meal was different, ranging from stews, pastas, rice dishes to fish and chips. Day 4 – As usual we were woken at 6 am. And again we had glorious weather with clear skies. After breakfast we started to make our way to the base of Mawenzi peak, the terrain grew a bit more rugged with some nice rock formations. There was another group doing the same route and we kept catching up with each other. Today’s camp was at Mawenzi Tarn at 4,300 metres. This was a spectacular location right at the base of the rugged peak near a small lake. The scenery was now quite barren with almost no vegetation around anymore. 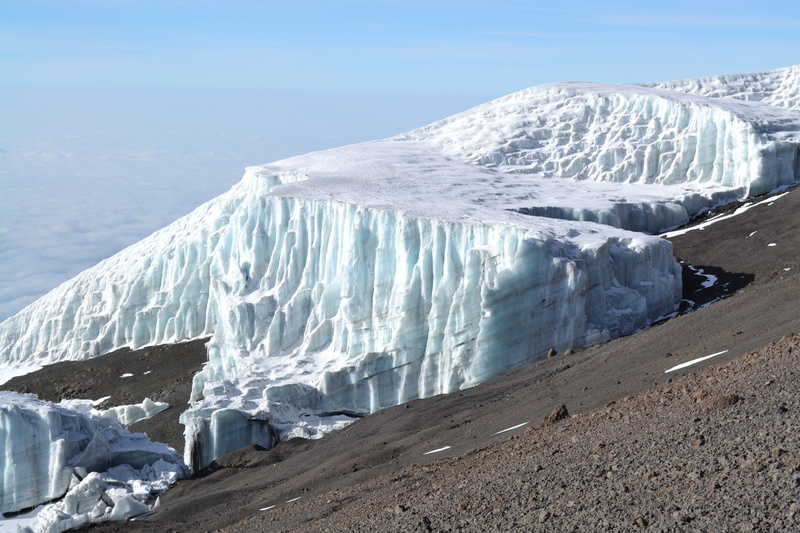 For the acclimatisation walk we climbed up on the rim surrounding the camp and from there we had a view of the saddle between Mawenzi and Kibo. We could see base camp in the distance too. We were starting to get close now. The clouds moved in and this created an eerie quite beautiful landscape. The nights are getting colder too. So far we had been very lucky with the weather. Day 5 – Another breakfast outside with amazing views. We marvelled over the fact that the porters had managed to get the eggs this far without breaking them! 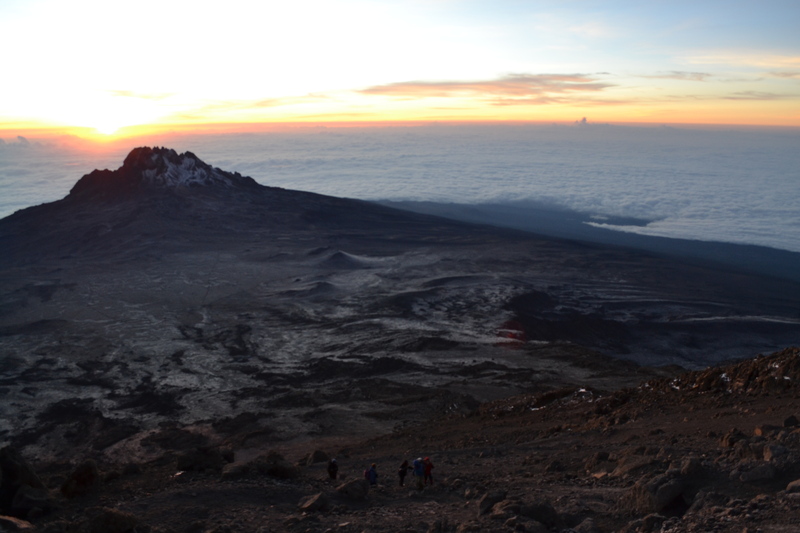 Then we set off from Mawenzi towards Kibo. The walk across the saddle is fairly flat and really barren but the landscape is quite impressive. We passed the wreck of a small plane that had crashed there a few years ago. The weather got colder and low cloud and some drizzle made our stops quite short. We had to keep going to stay warm. This walk also felt longer as we could see the base camp the whole time and due to the altitude we had to go slow. We arrived again at lunchtime and had to take a rest. 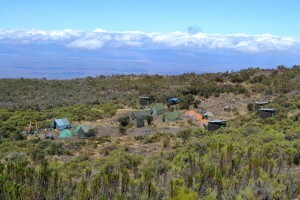 Kibo Hut is at 4,700 metres and the air is much thinner so everything takes more effort. 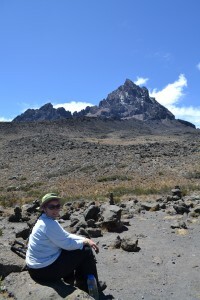 This afternoon we did not do an acclimatisation walk and instead rested to get ready for the summit. A large group of British rugby players came into the camp in small groups. They had an entire film crew with them and a huge team. We entertained ourselves watching them all come in. That night we had dinner and a briefing about our summit. After that we got ready and prepared ourselves. We went to bed early to try to get as much sleep as possible. So far the trek had been quite pleasant with beautiful hikes and we were all doing well with no one affected by the altitude. Day 6 – Wake up came at 11 pm with hot tea and coffee. We had an hour to prepare for the final summit. At 12 midnight we set off. It was luckily not too cold – though we were all very well wrapped up and looked like Michelin men! The trail already starts getting steep quite early on. I was struggling to get enough breath and after a while I broke off from the group with William as my guide to go at a slower pace. We started zigzagging along the scree walking very slowly, literally step by step. I plod along watching my step. Every once in a while looking up to see a trail of lights going up along the trail. The sky was full of stars and the plains of Kenya were full of lights. It was such an other-worldly experience. Every little while we would stop for a minute so I could catch my breath. The top looked quite close in the dark but we walked for hours. From one point to the next sometimes being passed and at other times you were passing others. William constantly checked if I was ok and was cheering me up by singing local songs. By 3 am my drinking water was getting icy and I had very cold hands but otherwise it did not feel too cold at all. We got to a place called Jamaica Rocks just before sunrise. This is the final bit to the top and you have to climb and walk between rocks. I could see the sign at the top, Gilman’s Point, when the sun came up. Turning around I had the most amazing views over Mawenzi and a blanket of clouds. Looking down its like the whole world is at your feet. Just as I was making my way to the top my mum came down with the other guide. She had made it to Gilman’s Point, which is at the summit but not the very highest point. With not much energy left she had decided to start the descent. 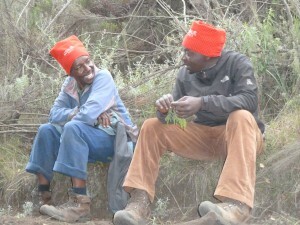 The other two in our group had continued on to Uhuru Peak with another guide. Well done to my Mum!! I then continued on to Gilman’s and then along the crater rim of Kibo peak to the highest point of Kilimanjaro – Uhuru Peak. The altitude treated me well and we could set a good pace now as it was fairly flat. Getting to Stella Point I saw the first glacier which was very impressive and the views continued to be so amazing. I started meeting people on their way back and kept going. The other two in our group I met at Stella Point. They had made it to the top and were on their way back. 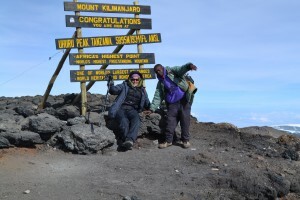 By 8.30 am my guide and I made it to Uhuru Peak, the highest point of Africa at 5,896 metres! The sky was clear and it was getting actually fairly warm. The glaciers sparkled and even Mt Meru peaked up out of the clouds – an absolutely amazing moment! We started making our way down. Seeing Gilman’s from above in the daylight I was so glad to have done it in the dark not knowing how high I had to go! We walked straight down the scree which is like going down a sand dune. Getting close to the bottom I was getting very tired. Thankfully some of the porters came up to assist me and were a great help. By 12 midday I was back at base camp. We had lunch and after an hour we set off towards our next camp. 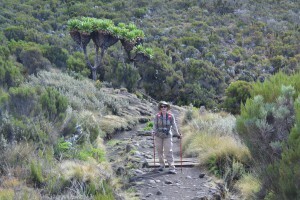 The walk was downhill and we descended fast through the saddle and more beautiful landscapes. The vegetation started coming back the lower we got . I reached the final camp, Horombo camp at 3,700 metres, by late afternoon. That night I slept like a log. I was so tired. 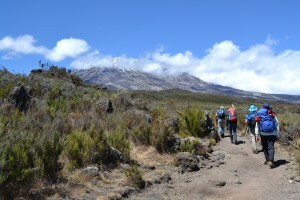 Day 7 – Our last day and more glorious weather. The team sang for us one final time and we said our huge thanks to them. They had been amazing all along, very helpful and professional. Most of the team would go straight out the gate, only the chef and waiter had one final meal to prepare. We started descending again. The walk was pretty. I was going pretty slowly though now. After days of hiking I was in some pain now, partly due to blisters on my small toes. 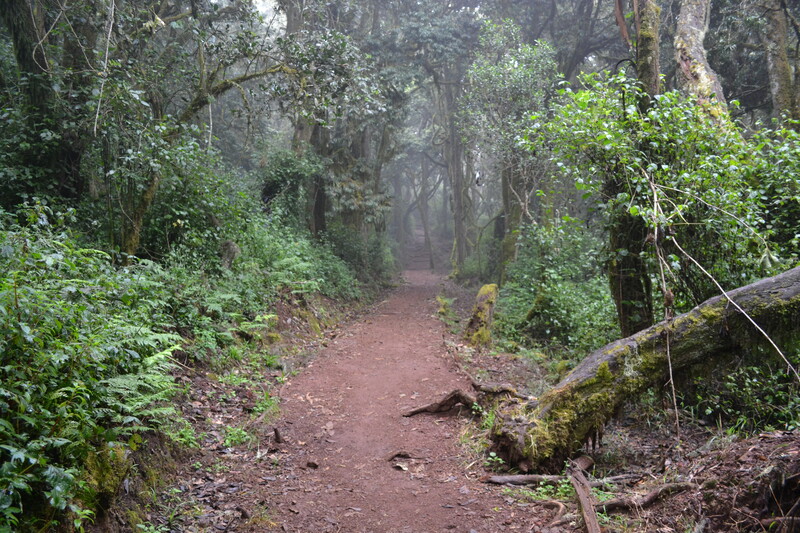 The route went from alpine vegetation to cloud forest to rainforest. We saw beautiful flowers along the way and even some chameleons and colobus monkeys. 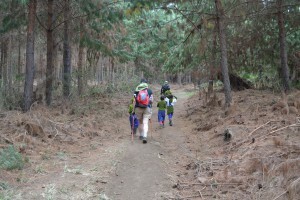 After our last hot lunch we went the final kilometres through the forest to the Marangu gate. 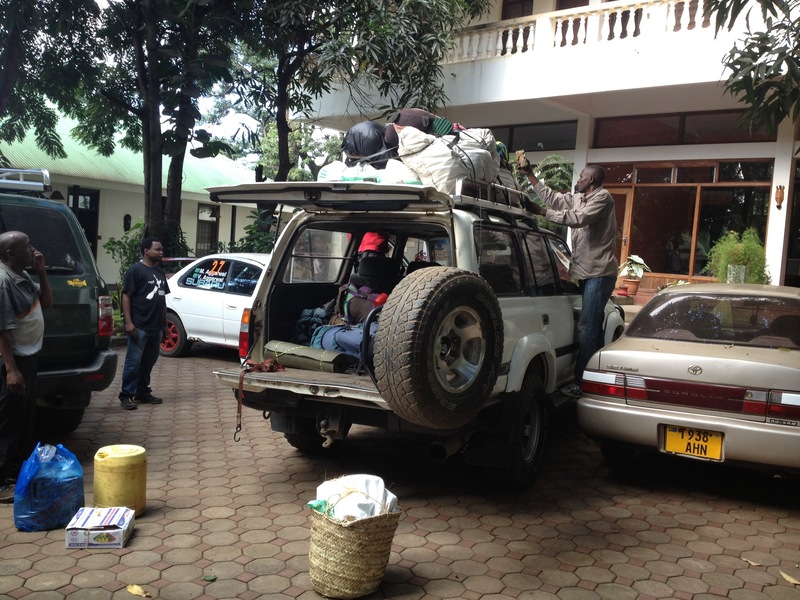 A final goodbye to our team and we were brought back to the hotel in Moshi for a long awaited shower!